SGST is one of the tax components of GST in India. SGST Act expands to State Goods and Service Tax. It is one of the three categories under Goods and Service Tax (CGST, IGST and SGST) with a concept of one tax one nation. SGST falls under State Goods and Service Tax Act 2017. A simple understanding could be that, when SGST is being introduced, the present state taxes of State Sales Tax, VAT, Luxury Tax, Entertainment tax (unless it is levied by the local bodies), Taxes on lottery, betting and gambling, Entry tax not in lieu of Octroi, State Cesses and Surcharges in so far as they relate to supply of goods and services etc. are subsumed into one tax in GST called State GST. All the tax proceeds collected under the head SGST is for State Government. 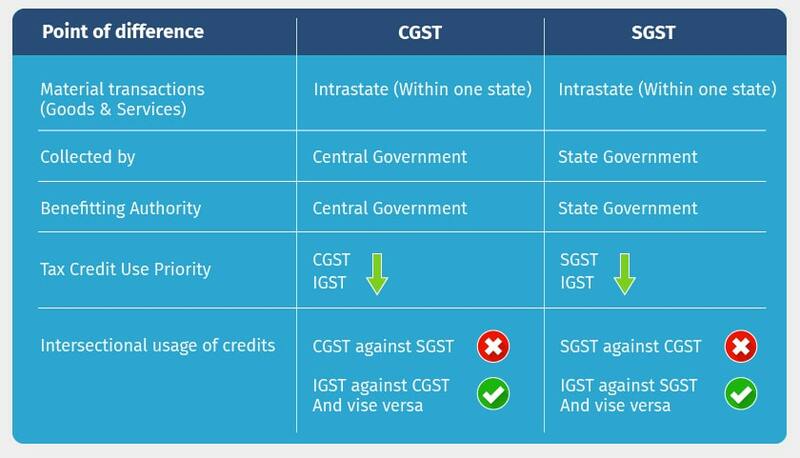 To identify whether Central Goods & Services Tax (CGST), State Goods & Services Tax (SGST) or Integrated Goods & Services Tax (IGST) will be applicable in a taxable transaction, one needs to first know if the transaction is an Intra State or an Inter-State supply. Intra-State supply of goods or services is when the location of the supplier and the place of supply i.e., location of the buyer are in the same state. In a transaction involving supply within the state, a seller has to collect both CGST and SGST from the buyer. The Central GST gets deposited with Central Government and State GST gets deposited with State Government. Inter-State supply of goods or services is when the location of the supplier and the place of supply are in different states. Also, in cases of export or import of goods or services or when the supply of goods or services is made to or by a SEZ unit, the transaction is assumed to be Inter-State. In an transaction involving supply between two states or outside the state, a seller has to collect IGST from the buyer. A trader in Indore is selling a Printer worth Rs. 10,000 to a trader in Bhopal. The CGST for this transaction will be 14% whereas the SGST will be 14%. The trader will have to charge Rs. 1,400 as CGST and Rs. 1400 as SGST from the trader in Bhopal and the respective amounts will be deposited in the Central and State Government accounts. Now, the trader from Bhopal (in the given example) is supplying this printer to his shop in Bengaluru. As this is an inter-state trade, the Bhopal shop keeper will charge IGST of 28% i.e. Rs. 2800 on the basic value of the product (Rs. 10,000) from his Bengaluru shop and deposit the IGST amount into the government account.